A good application of heat transfer can be seen when you buy a cup of hot coffee at your favorite coffee shop. The hot coffee heats the paper cup by conduction. The cup provides little insulation, so many coffee shops provide a cardboard insulator to protect your fingers from getting burned. A plastic top not only prevents spilling when you take out the coffee cup, but it also helps to reduce convection cooling of the coffee. Why is the coffee cup made of paper? How does the holder prevent burns? What is the purpose of the coffee cup lid? 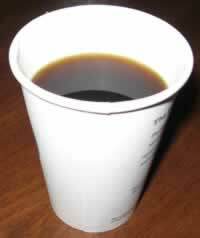 The typical take-out coffee cup is usually made of a heavy paper material. Although paper is a fair insulator, the cup material is thin enough that the hot coffee heats it by conduction, making the outside surface hot to the touch. The lip of the cup is rolled over for strength and so you won't cut you lips. 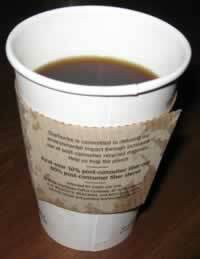 Styrofoam coffee cups do a better job of insulating, because the material does not conduct heat well. Also, A Styrofoam cup is several times thicker than a paper coffee cup, adding to its insulating properties. Most businesses no longer use Styrofoam cups because they are not biodegradable and are thus not good for the environment. There also is concern about chemicals from the Styrofoam leaching into the hot coffee. Since the paper coffee cup gets so hot, many coffee shops provide a thin cardboard holder so that you won't burn your fingers when holding the cup. 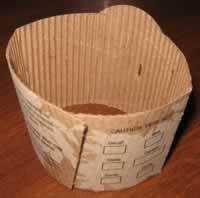 The holder is corrugated, such that are there air gaps and only the ridges touch the cup. The air gaps mean the heat transfer must be done by convection, which is less effective than conduction. With only the ridges of the holder touching the hot cup, much less heat transfer by conduction occurs. Usually, a plastic lid is included with the take-out coffee cup. This is primarily to prevent spilling the coffee when you walk or drive. But also, the lid traps in the hot air surrounding the coffee, preventing heat loss from convection. 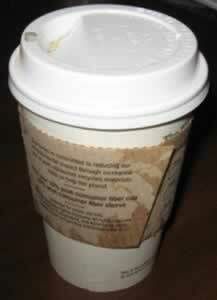 Heat transfer can be seen when you buy a cup of hot coffee, which heats the paper cup by conduction. The cup provides little insulation, so a cardboard insulator is provided to protect your fingers from getting burned. A plastic top prevents spilling and helps to reduce convection cooling of the coffee.